When checking my email this morning I realized , again, how much I tend to go overboard. Because I am interested in so many different things, I visit all kinds of websites. And, often, I check the little box that puts me on their mailing list. Such a little, seemingly innocent, action sure can create a deluge! But if I unsubscribe I might miss out on something. So I usually just browse thru, deleting as I go. When I see something that looks interesting I may check it out. Most often, tho, I leave it till later, which only makes the job take longer next time. When I get more time I scan more closely, saving what I want. My email folders grow larger. To make matters worse, when I visit the sites, many times I will create bookmarks, causing those folders to grow. It can get a little overwhelming, at times, but at least I always have something to check out! One site that has me on their email list is www.instructables.com. You can find almost anything on this site! Often, something quirky will catch my eye and I have to check it out. I hardly ever really do any of the activities, but I love reading about them and looking at the pictures. One that recently caught my eye was this http://www.instructables.com/id/Magnetic-Sugru-Stix/ This is one of those things like I always wished I could get my kids to try, and now my grandkids. I don’t know why I can’t seem to want to do it for myself. I guess I would rather do it with someone. The Instrucables site reminds me of the “Make” magazines that I get from my son once they are done with them. After I check them out, wonder about the ideas, then finally realize they are just ideas–not something I really want to do–I pass them on to my grandson. I don’t know if he ‘makes’ anything or not. But at least we enjoy reading about the ideas. We all seem to share the same spark. Since I enjoy knitting I subscribe to some of those sites. Purple Kitty Yarns www.purplekittyyarns.com offers some free patterns. Creative Knitting www.creativeknittingmagazine.com sends me helpful “how-to” info. I get notices from two yarn companies, Knit Picks www.knitpicks.com and Loin yarn www.lionbrandyarn.com. Both offer free patterns as well as other patterns, yarn and knitting supplies. I purchased a set of interchangeable needles from Knit Picks. Knitty, www.knitty.com is another site that has me on their list. I just love this site! Unlike Instructables, I actually do things from this site. I like looking at their knitting patterns–they have lots of free ones, and very helpfulf tutorials. They are connected to Interweave, http://www.interweave.com which has magazines on crafts and art. I get emails from two other Intervweave sites besides knitty.com: http://www.artistdaily.com and www.sewdaily.com, Interweave sends me offers of free ebooks that I can download. You are starting to see why my mailbox fills up so quickly. But it doesn’t stop here. I am also subscribed to www.flylady.net. This is one I browse through. I send the kids challenges to my young granddaughters. I usually delete the testimonials cause I just don’t have the time or desire to read them. I did at first. I really think Flylady has a good thing going. This site helps motivate me. I don’t do ALL the challenges and my dishes aren’t always done, but I really like the looks of a clean, shiny sink! Like I say, the site helps motivate me. And I need that motivation. I like the looks of a clean, well ordered home, but unfortunately I don’t love housework. But, I think/hope that is improving. I tend to go in spurts with housecleaning like I do with other stuff. So any motivation I can get helps. From the Flylady site I got hooked up with Big Tent www.bigtent.com I was subscribing to to some exercise emails, but discontinued them. It was just too much. I liked the exercise idea and I know I need to do it, but when I went to the website I hated the sound of the coach’s voice! I just knew I could never listen to that very long. But, of course, that didn’t stop my from saving some of the emails. (Wish I knew how to add a smiley face). I also get two more emails from the Flylady link, www.savingdinner.com and www.missussmartypants.com. At least the Miss Smarty Pants is a weekly, not daily one. I have listened to her radio a few times, but find I would rather just read the emails–I do always read hers, and occasionally visit her site. I feel they are both good sites, but I am considering removing myself from the Saving Dinner email and just visit the site. I recently joined the National Gardening Club, www.gardenclub.org and get an email called “Extra Dirt” from them. It features items that members have tested and approved. I like to see what is on the market. I wonder if any items I test will end up there? National Wildlife Federation, www.nwf.org lets me know when the subscriptions for my grandchildren are due. I like giving magazines to the kids as gifts. Its something fun, educational and lasts all year, not just for the moment. The older kids are getting too old for these magazines, but the younger ones still love them. I haven’t found any magazines I want to subscribe to for the older ones yet. I thought of “Make” for one of my grandsons, but it costs too much. I can afford the NWF ones, it is a good value for my money. www.motherearthnews.com, lots of ideas from this one. I used to get this magazine from friends when they were done, then passed it back. This seems to be a magazine people want to hold onto. You can now get back issues on DVD. Some other magazines I used to get were “National Gardener”, “Homesteading”, and “Organic Gardening” (I used to have back copies of this one). But, alas, every time I moved I had to get rid of more stuff, and now the magazines are gone. But, thanks to technology, I can get the articles via web now. www.tumbleweedhouses.com, The tiny house site is interesting, although I would never want to go as small as that. And it seems to me their homes cost a lot for being so little. www.30daygourmet.com, This one is mostly just ideas and sometimes a recipe I like. I really haven’t ever done the freezer cooking. Sometimes I freeze leftover, but don’t plan it. I don’t even plan menus or meals ahead. I know all the ‘experts’ say we should. But every time I try something comes up and I have to change it anyway, so I just don’t bother. When I started this post I really didn’t expect it to be quite so long. It’s just that I see something and get carried away on to another and then another thing. Even though some times it can sometimes be a little overwhelming, at least I never get bored! I seem to be in a writing mood. This is my thrid post this week. I tried to do this post a few weeks ago, but got discouraged with my knowledge (really my lack of knowledge) of technology. But since then I’ve had a bit more practice I’m going to try again. I love to search the web! Seems like there is always something new, or different that I haven’t noticed before. I tend to visit the somewhat quirky sites-to see things a bit different from the norm. Some of these sites I return to over and over. I’ll try to list a few. Since I have moved to a smaller house I love to browse ‘Apartment Therapy’. www.apartmenttherapy.com/ This is a site filled with ideas for living in small places. fugal living and more. I usually get an idea of something I would like to try. Many times they are just ideas-I never really do it. But I really enjoy the idea of it. Another is www.digsdigs.com Again, really love this site. And how about www. freshome.com where I can find ideas by rooms or search. Often I will click a link from a site which takes me to another link and from there I go on and on. One idea a really love (idea only as I think a lot of these ideas are way out of my budget range) is a circular kitcehn. It can be freestanding or in a corner. It is very compact and can be completely closed off. This would be great for those of us who don’t clean up our messes quickly. I don’t remember which site I first saw it on, but I find it again from time to time. 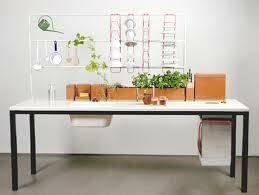 Another idea (this one is a bit quirky) for a kitchen is the Flow kitchen and Flow kitchen 2. I think I found it on www.studiogorm.com Such a neat idea. After washing the dishes, by hand, they are hung to dry in the place in which they are stored. The water dripping off waters the plants underneath. And it looks so streamlined! I love the look of minimilism. Then there is the bathroom. I want to remodel mine. It is arranged in a way that it is very close quarters. One day my granddaugher was using the facilities and started yelling “Grandma, my hair is caught. !” She had leaned forward with her head on the sink cupboard and her hair was caught in the cabinet knob. Funny, but it shows a remodel is needed. So I have been searching for ideas. I”ve found plenty. My bookmarks are imense. And I clip pics a lot. I like to look at the google image site. Often I will click on a site from there. I usually have several tabs open at once. And many times several windows too. Just think, a really small comfortable tub. I love to take long soaks. My present tub is not at all comfortable. It is too long and the back doesn’t slope enough. I have tried to find a bath pillow, but haven’t been successful in finding what I want. In the few times I’be taken a bath–I take showers now–I use several towels. But still not very comfortable. A friend told me to search for ‘world most comfortable bathtub’. I did and guess what came up? The Ravak ‘YOU’. It has a really sloping back and arm rests and is deep! Even has a headrest. I have no idea how much it costs or if it is even available in the USA. A lot of the sites I visited for smaller bathroom fixtures were in Europe. For my laundry/bathroom I purchased a tiny sink locally. I bought another to use in my main bath. But some of my kids think it is too small for the main bathroom. So I am still looking. I may return it, haven’t decided yet. I found one I like at Ikea www.ikea.com , the Lillagen. It is narrow which is good as it would be best if my sink didn’t stick out over 12″. The problem with the little sink I purchased is that is is wall hung and there is no place to put soap, etc. This Ikea sink has an insert to hold a few items and it has clips on the side for towels. Or I could get a bowl type sink that sits on a counter/shelf. We will have to remove the cabinet and I really like the look of shelves. Maybe with baskets? I want a beach theme. On one site I saw a pic of a clock with sand and waves. I liked the restful feel. I have a shower curtain, white with lengthwise blue stripes. It has a restful beach feeling. I could put my huge straw tote on the floor to hold towels. Then maybe hooks for wet ones and robes. And some shelving. I also have a special cabinet for my aromatherapy, but it needs something (a shelf?) to sit on. I will keep getting ideas until I find something that works. I have changed my bedroom two or three times already, but I really like the way I have it now. I made the other bedroom into a library, office, craft, sitting room. It has a loveseat futon for a guest. I would add a photo, but can’t with my Ipad and don’t have the photo on my laptop yet. I wIsh the pics in this post looked better. Althought I centered them, I think they woukd have looked better either on left or rig side. I don’t know how to edit photos yet, if it is even possible. So it will have to do with this for now. Well, I guess Ive run out of steam. I will probably add more sites on a later post.